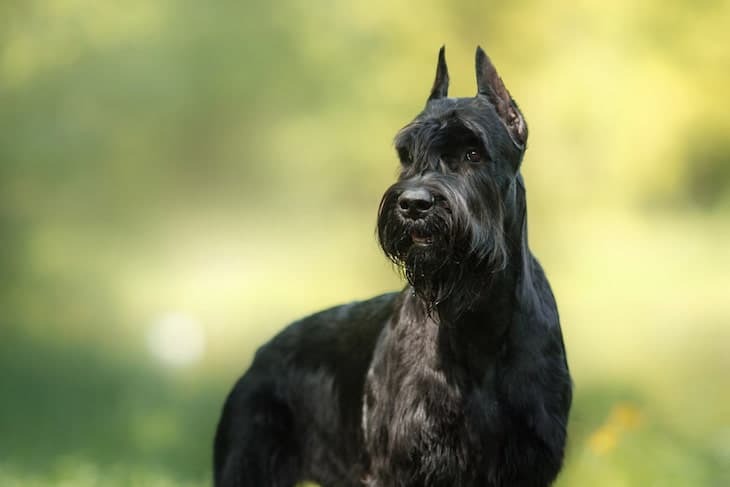 Hailing from Germany, the Giant Schnauzer temperament is driven and loyal. Bred as a working dog, the Giant Schnauzer was developed to help drive cattle and eventually worked in stockyards and butcher shops. Some even worked in breweries as guard dogs. During the early 1900s, this breed began work in the police force in Berlin as well as other cities in Germany. It soon became their chief job. Unfortunately, the German Shepherd beat the Giant Schnauzer dog as the primary police dog in the United States. The largest of the three Schnauzer breeds, the Giant Schnauzer has an authoritative appearance and rugged look. Though they look intimidating, Giant Schnauzers are actually quite playful. The Giant Schnauzer is a large dog with an equally large personality. Their stoic demeanor is contradicted by a lively twinkle in their eyes. The Giant Schnauzer boldly approaches life and has a dominant personality but is also spirited and independent. That being said, the Giant Schnauzer dog can handful – even for experienced pet owners. Thanks to their history as guard dogs, Giant Schnauzers make excellent watchdogs and are loyal family protectors. They have a natural instinct and ability to watch over their humans. Giant Schnauzers also have a natural ability to distinguish between friends and foes – though “foes” may just be a stranger walking down the street! They are courageous and reliable, making them perfectly dependable family companions. Giant Schnauzers are not always suitable for families with babies or toddlers due to their high energy level and playfulness. Ensure your Giant Schnauzer puppy is socialized early. A well-socialized Giant Schnauzer puppy will make for a well-mannered adult. Don’t let a Giant Schnauzer become bored – unless you want your house destroyed! Exercise – both physical and mental – will help combat boredom and keep your pup – and house – happy. Due to their high energy, this breed does not do well in apartments. A Giant Schnauzer does better in a home with a yard to play in. But, that doesn’t mean they are outdoor dogs; they adore their family. Training a Giant Schnauzer isn’t all its cracked it up. Though intelligent, this breed can be very territorial. They love their humans and want to protect them. Giant Schnauzers learn quickly – but only with consistent and firm training. They have an amazing mind that should not go to waste. This is a breed that loves to have a job. Teach them to find things for you, do tricks, carry toys, or even partake in obedience or agility training. Training should start early – Giant Schnauzer puppies can be headstrong. Starting early will ensure your adult Giant Schnauzer is well-mannered and disciplined. Are you ready to find your perfect Giant Schnauzer puppy? You’ve got a couple options. One option is to find a Giant Schnauzer for sale from a breeder. Breeders are a great option for those who looking for a purebred Giant Schnauzer or for those looking for an AKC registered Giant Schnauzer. A second option is an adoption. Adopting a Giant Schnauzer from a rescue or shelter is a great option if you are looking for an adult dog or a Giant Schnauzer mix. Giant Schnauzer puppies for sale will cost anywhere between $1,800-$5,500. The Giant Schnauzer price depends on where you purchase your puppy from, the availability of breeds, and the superiority of the breed lines. If you looking to purchase a Giant Schnauzer from a top breed line, you can expect to pay upwards of $5,500. Adoption, on the other hand, will not cost as much. The Adoption fees from private rescue organizations can range between $150-$350 while fees from local shelters are less expensive. Adoption fees also depend on location. If you’ve decided on adopting a Giant Schnauzer, your first task should be researching local rescue organizations and shelters. A great Giant Schnauzer rescue resource is the G.I.A.N.T. Schnauzer Rescue Network. They have a wonderful directory of Giant Schnauzer rescues categorized by state. Keep in mind when adopting a Giant Schnauzer that you will not always have the complete history of the dog you are bringing home. 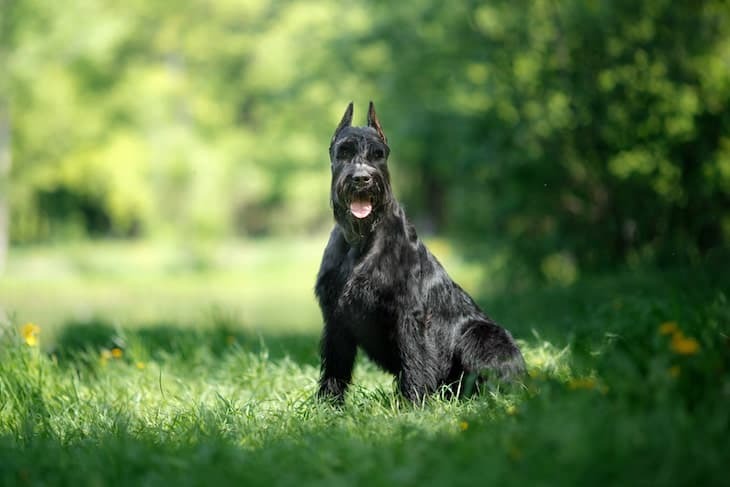 When purchasing a Giant Schnauzer from a breeder, there are several factors to consider. A great place to start is the Giant Schnauzer Club of America. They have a list of reputable breeders as well as information on the breed itself. Choose a breeder close to home so you physically visit their boarding facility. Make sure their kennels are clean and the dogs and puppies are well taken care of. Giant Schnauzer breeders should be happy to answer any and every question you may have regarding the breed and their breeding protocol. For example, ask about health certificates, socialization techniques, and if you should know anything specific about their litter. Additionally, the breeder should ask you questions to make sure you are the right fit for one of their Giant Schnauzer puppies! The Giant Schnauzer weight is between 60-85 pounds for a male and 55-75 pounds for a female. The Giant Schnauzer size is between 25.5-27.5 inches for a male and 23.5-25.5 inches for a female. Giant Schnauzer grooming is moderate at best. They require brushing three times per week to prevent matting of their double coat; they have a wiry outer coat and soft undercoat. 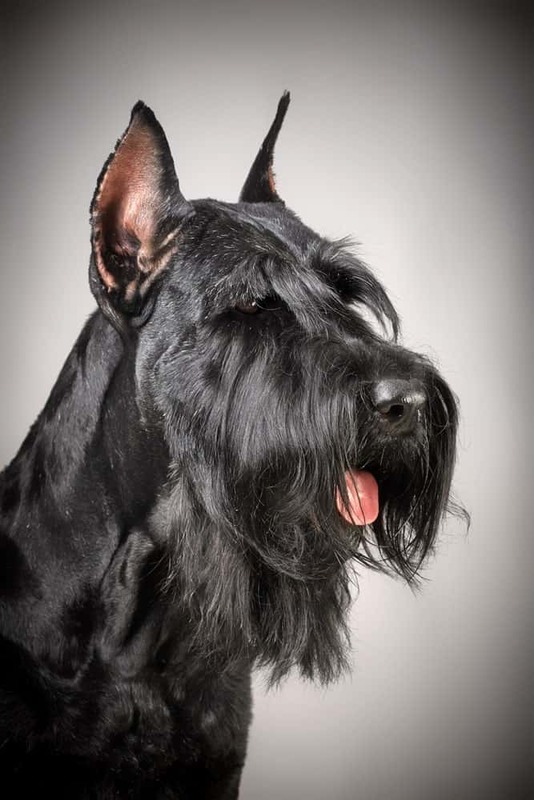 Giant Schnauzers also have a distinct beard and eyebrows along with a black or salt and pepper coat. Expect to groom your Giant Schnauzer – either by yourself or by a professional groomer – every six to eight weeks to keep their coat in tip-top shape. Giant Schnauzer shedding is seasonal, and they are hypoallergenic. And Squamous Cell Carcinoma (a toe cancer found in dark-haired dogs). The Giant Schnauzer is actually more energetic than most large breeds. They require a lot of exercise in the form of long daily walks, dog park play sessions, or a long game of fetch in the backyard. Giant Schnauzers make excellent workout buddies. If you’re looking for a dog to accompany you on your runs, hikes, bike rides, or swims, the Giant Schnauzer is the perfect companion. The Giant Schnauzer is a big dog with a big personality. They admire their human companions and will protect them however they see fit. Energetic, intelligent, and playful, the Giant Schnauzer is an excellent dog for families with an active lifestyle and older children. Giant Schnauzers have endearing and challenging qualities. If you can handle the challenging qualities, this is a breed that will provide a lifetime of laughs and happiness.